Сочи, заказ цветов на дом с доставкой . 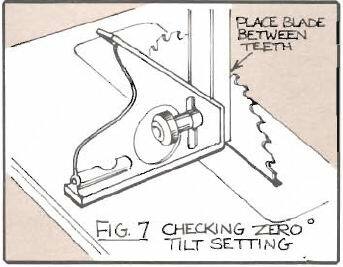 Now let’s check the blade tilt or squareness of the saw blade to the tabletop when the tilt scale (on the front of the machine) is set at zero. To do this raise blade to maximum height and place your square on the table so that the square blade rests against the saw blade between two teeth (Fig. 7). Make sure that the table insert is flush with the tabletop. If the saw blade is evenly snug against the square, from tabletop to gullet between two teeth, lock the tilt handle and set the pointer to zero. This entry was posted on Понедельник, Январь 9th, 2012 at 4:35 пп	and is filed under woodworking. You can follow any responses to this entry through the RSS 2.0 feed. Both comments and pings are currently closed.